See also: Mark Latham's political gift to John Howard of 19 Nov 2007; Labor Leadership Contenders' Views on East West Link - Albo opposes it! of 6 Oct 2013; Contendor for Australian Labor Party leadership defends Syria against US-sponsored terrorism of 21 Sep 2013; Appendix: "refugee rights" activist opposed to Albanese (includes video). Former Labor Party leader Mark Latham and two mainstream corporate newspapers, the Sydney Morning Herald and the Australian Financial Review have shown their particular dislike for Anthony Albanese, a candidate for the leadership of the Australian Labor Party. Albanese's video speech in support of Syria against terrorism was embedded in an article published on candobetter on 21 September 2013. On 26 September 2013 the Australian Financial Review published an article by former Labor Party leader Mark Latham, Why Anthony Albanese shouldn't lead Labor. Judith Ireland of the Sydney Morning Herald referred to Latham's article in Anthony Albanese is an 'intellectual lightweight': Mark Latham. The article featured an embedded Sydney radio 2UE interview with Mark Latham. The substance of Latham's case against Albanese was that he had failed to distance himself from NSW Labor member of Legislative Council Ian Mcdonald who had been found on 31 July 2013 by the NSW Independent Commission Against Corruption (ICAC) to have behaved corruptly. "...The Hawke/Keating economic model of open, competitive markets can be used to appeal to Australia's rising aspirational class. Obstacles exist internally, but the sooner Labor stops thinking of itself as a trade union party rather than an aspirational party, the sooner it will regain power." "After 20 years of economic growth and wealth accumulation, people have become more self-reliant. They have less need for government and less interest in government. This should work to the ALP's advantage. It no longer needs to juggle dozens of issues simultaneously, developing a labyrinth of new spending programs that drive the budget into deficit." "... he was wrong to endorse ... protectionism ..."
"If he wins next month's leadership ballot, he will be a case study in inner-city, left-wing bunkum." Latham described Anthony Albanese's speech, embedded above, as "one of the worst speeches in recent Labor history" and a "a throwback to the 1960s, a narrow, insular pitch to the party's ever-shrinking industrial base". Given Mark Latham's support for the re-election of John Howard in 2007 and his opposition to the ACTU's "Your Rights at work" campaign, his hostility to Anthony Albanese seems a very good reason to vote for him. Another group who have shown hostility to Anthony Albanese are ostensible refugee rights activists. 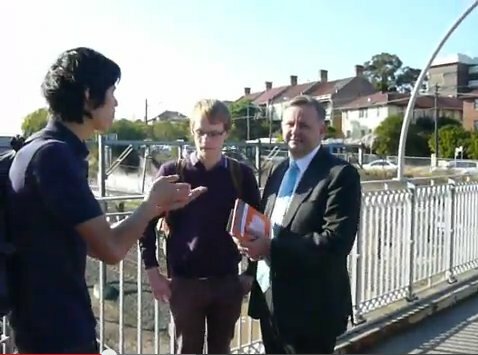 In this video, whilst campaigning for Labor Party Leadership on the railway bridge at Sydenham station on 29 Aug 2013, Anthony Albanese is confronted by a refugee rights activist who objects to Papua New Guinea asylum seeker solution of the previous Federal Labor Government. In this video Albanese is denied a chance to state his view. It is curious that, unlike Albanese, who spoke up for Syria, few ostensible Australian refugee rights organisations concern themselves with what drives many refugees to flee their own countries, namely wars fought against Libya, Afghanistan, Iraq and Syria, Somalia, etc. by the US, the UK, France, Australia and their allies. If the mainstream media dislike Albanese, this is an indication that his policies are friendly to the Australian people and inconvenient to the corporate sector. Latham is an interesting and amusing commentator, but he works for Fairfax (regular contributor to the Australian Financial Review) and he has a very narrow understanding of the society. He admitted that he could not really grasp what he was being told about the Tasmanian forests, just prior to running for election, and he supports 'aspirational' voters. To support aspirational voters you need to not understand finite resources or that money does not look after the environment and that what is good for economic growth is not usually good for society overall.